even provide a full-size sleeper sofa. excellent restaurants, and famliy fun. are only 5 minutes away! and again. Sorry no smoking or pets. Beach Badges Provided at no charge,Wireless Comcast High Speed Internet Access at no charge, Video Library with 100 titles at no charge. Unlimited long distance calling at no charge. View of the ocean for miles. This beautiful, oversized deck looks directly out over the beach and ocean. How tranquil! This really is the breathtaking view from our deck. Living Room with 14' ceilings and gorgeous ocean view! 6' Walk-in ceramic tile shower. Beautiful views of Brigantine and Bay area. We have been staying at this condo for several years. It is like our home away from home. It has every modern convenience and is very clean. The sunrises are spectacular to see from every room. Really a lovely place to spend some time at the jersey shore. Homeowner Response: Thanks for the kind words. Most of our visitors are repeat visitors or referrals from friends. Our visitors are our best advertising! Nice condo and nice town! Great views from inside and deck. I've stayed in dozens of places up and down the east coast, and this is one of the nicest. Great condo: all furniture, appliances and ammenities were lovely. You cannot beat the location or the view. Owners were easy to contact and obtain information from. We totally enjoyed our visit. Website information was accurate. Homeowner Response: We try very hard to keep the condo updated and our websites up to date. Our intent is to under promise and over deliver for our visitors. we are happy you enjoyed your visit and hope you will eturn soon. I have been taking my elderly Mom to the Condo for 7 years! She watches the dolphins, fisherman, dogs and surfers from the living room couch! The Condo is immaculate and well organized. 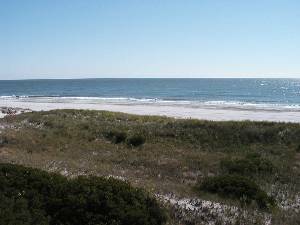 Although just a few miles from Atlantic City, the island of Brigantine is a family atmosphere that has private uncrowded beaches. It is beautiful anytime of the year. If you are looking for the "Jersey Shore" as seen on TV...this is not it!! Homeowner Response: Because we are right on the ocean with outstanding views we get vistors 365 days a year. This condo is great in warm and cold weather, rain or snow. The views are fabulous through all 4 seasons. the BEST view from a very roomy deck. Have stayed here multiple times and each time is good. Great place in comfort, location, and ease of access (my mom's handicapped). Peaceful, but near the action, and fabulous view of the ocean. Homeowner Response: Thank you for your comments Nancy. 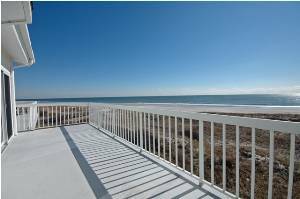 The beauty of this oceanfront condo is that it's great in all kinds of weaterh because you can still enjoy the ocean woithout going outside! for many years and this is one of our favorite spots. The unit owners have thought of everything when it comes to relaxing, from movies, appliances, deck chairs, cleanliness and a beautiful ever changing view of the ocean. 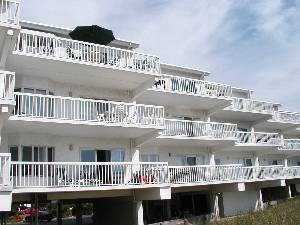 The island is a perfect getaway from the hustle of everyday life but close enough to the action of the Casinos or a trip into Cape May. You'll love it! Wonderful view as well as great accomodations.AThe view from the master bedroom is priceless. Loved every minute of my vacation there. We are headed back for a 4th year! The view is unsurpassed in area. Brigatine is a quiet paradise 5 minutes from AC. 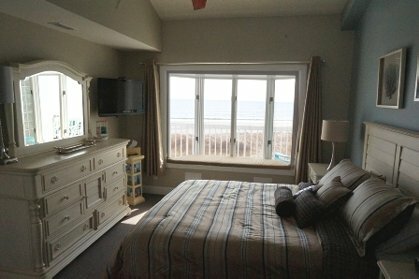 My Mother (87 years old) has easy access and can see the beach and ocean from the couch and bedroom. Immaculate. Highly recommend. Just don't book our week!! This unit is so much better than the ad, the skylights make this condo feel much larger and the natural light is wonderful. The furnishings are modern and up to date, the beds are very comfortable and the views spectacular. Located on a great beach spotit is very convienent to all the shopping and island activities. The owner was very easy to work with and honest about this property. Thanks for a great stay. John D.
Just got back from staying at this WONDERFUL condo. It has all the anemities of home. It was very clean. And the view of the ocean was phenomenal. Woke up to beautiful sunrises!!!!!!!!! Can't wait to go back. R. Ernst of Philadelphia, PA, We have stayed in the condo 4 times now. My wife and I just love the views from the living room. 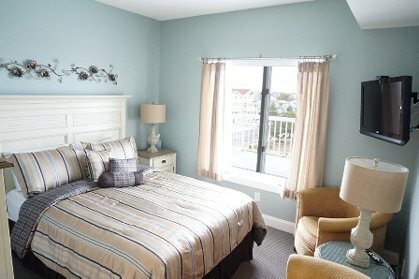 We can sit on the deck and enjoy the ocean or even enjoy it from the living room or master bedroom. What a wonderful find!! We loved the condo - the beach and the fantastic views from the balcony! i've been in dozens on condos up and down east coast. this might be the nicest of them all. We have stayed in the condo for 3 years now. We just booked for 2003. The condo is always clean and well maintained. Mr. Trimble is always accessible if there are any questions. We love it. Rates and Dates are subject to change without notice. Call for rates. Full week rentals only from March through October. Weekly rates range from $1400 to $3400 per week depending on the time of year.